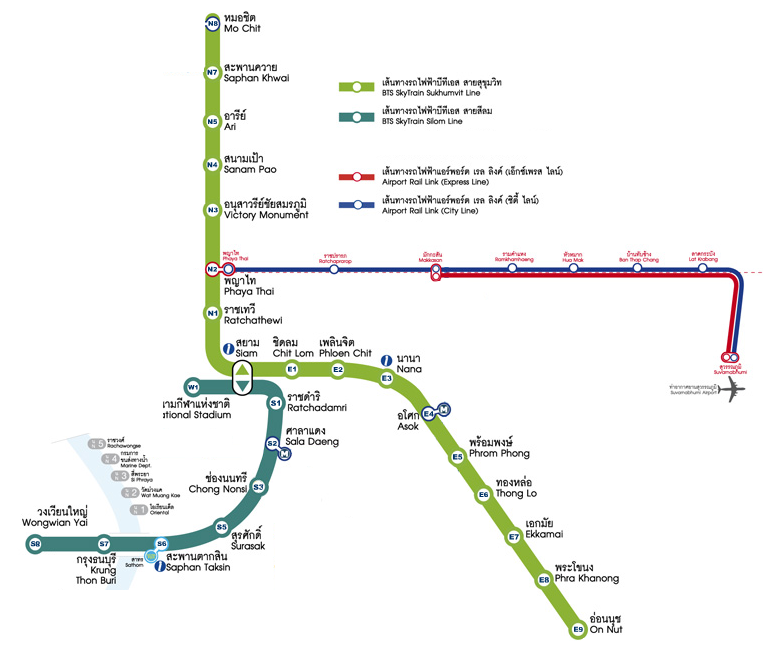 The BTS Skytrain has two lines – Silom and Sukhumvit. The BTS Skytrain is different from the Airport Rail Link and Subway (MTR or Metro Rail as others would call). The National Stadium (W1) has direct access to MBK Shopping Center. MBK is one of the largest shopping malls in Bangkok. Also near the National Stadium Station is Bangkok Art and Culture Center. Siam Station (Central Station) is the center of everything that is Bangkok. Siam Paragon, Siam Discovery and Siam Square are accessible from this Station. Also nearby are Siam Ocean World, Madam Tussauds Wax Museum, CentralWorld Shopping Complex and some posh hotels like Centara Grand and Siam Kempinski. Ratchadamri Station (S1) is the gateway to Bangkok’s luxurious homes, hotels and malls. Lumpini Park and Erawan Shrine are here. The famous Four Seasons Bangkok, Marriot Courtyard and Anantara Baan Rajprasong are all here. For luxury shopping, Peninsula Plaza and Gaysorn are nearby. Sala Daeng (S2) is the nearest station to where I normally stay in Bangkok. This station is the gateway for Silom and Patpong Night Market. Around are clubs, pubs and bars and of course the sinful “upstrairs” shows. Dusit Thani Hotel and Pan Pacific are just nearby. Chong Nonsi (S3) is in Sathorn Road and has a nice view of Bangkok skyline. Nearby are Salaisap Market famous for outdoor shopping and street foods. Surasak (S5) is where the only Indian Temple in Bangkok is – Sri Mariaamman Temple. Saphan Taksin (S6) is where the Central Pier is located – for the Chao Phraya river tour. In this station is Our Lady of Assumption Cathedral – Bangkok’s Catholic capital. Also accessible from this station are Shangri-La, Center Point Silom Hotel and Bossotel Bangkok among other hotels in the river banks. Krung Thon Buri (S7) is on the other side of the Chao Phraya River and is mostly residential. There is not much to see here except the river. Hotels nearby are Hilton and Peninsula. Wongwian Yai (S8) is also residential area. King Taksin Monument is here. Mo Chit Station (N8) is the gateway to the very famous Chatuchak Weekend Market, Sofitel Centara Grand, Queen Sirikit Botanical Garden, Bangkok Butterfly Garden and the golf course Park of Rot Fai Park among others. Saphan Khwai Station (N7)has not much to offer except the local shops that sell second hand items and goods. Ari Station (N5) is a residential area for high rise condos and expensive restaurants. Sanam Pao Station (N4) not much to see except high rise buildings which I presume are offices. Phaya Thai Station (N2) is where Baiyoke Sky Hotel is famous for its buffet and the 360 degrees view of Bangkok skyline. Ratchathewi Station (N1) is the nearest station to Pratunam – Bangkok’s most talked about shopping area. This is also where Calypso Cabaret is – the famous extravagant stage show of lady boys. Siam Station (Central Station) is the meeting station of both the Silom and Sukumvit BTS Skytrain. Chit Lom Station (E1) gateway to Ratchaprasong shopping district. Also accessible from here are Holiday Inn, Intercontinental Hotel, Gaysorn and Erawan Shopping Malls. Ploenchit Station (E2) is the gateway to the more expensive hotels in Bangkok. Novotel, Fraser Place, Marriot, Chateu de Bangkok, Swissotel, Oriental Residence, Center Point, Bangkok Sivatel and a lot lot lot more hotels. Nana Station (E3) is the gateway to Nana Plaza which is famous for nightlife. 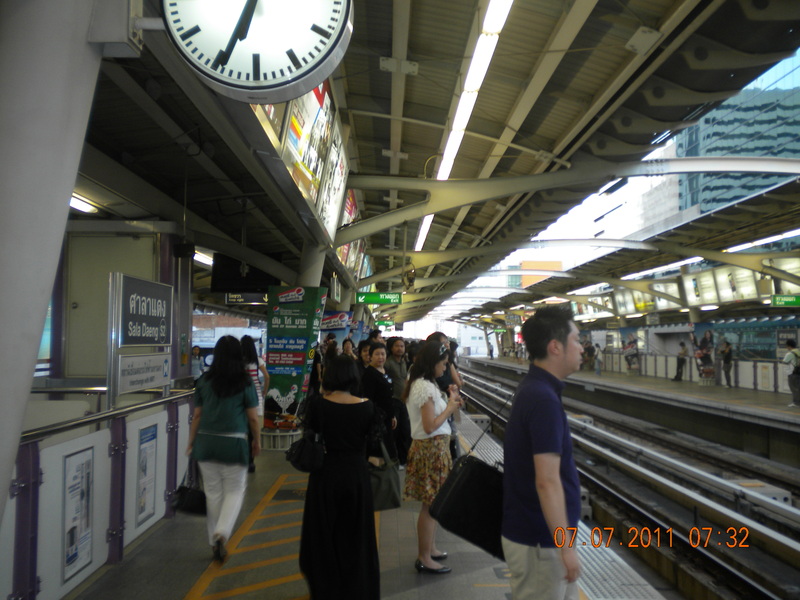 Asok Station (E4) is Bangkok’s fast growing business hub where posh buildings (of hotels and offices) are located. Phrom Phong Station (E5) is the nearest public Benjasiri Park. Also near here The Emporium Mall. Thonglor Station (E6) is in Sukhumvit Soi 55 and neighborhood of many hotels in Bangkok. It is famous for its restaurants and small boutiques. Pra Khanong Station (E8) is a residential area and has not much to offer. On Nut Station (E9) is also a residential area and Tesco Lotus Hypermarket is just within the station. It is a good decision to stop at all train stations, get down and have a little walk to see what it has to offer. A great and inexpensive way to explore Bangkok is through the Skytrain and its subway. I’ll bookmark your blog and check again here frequently. I am quite sure I will learn many new stuff right here! Good luck for the next!